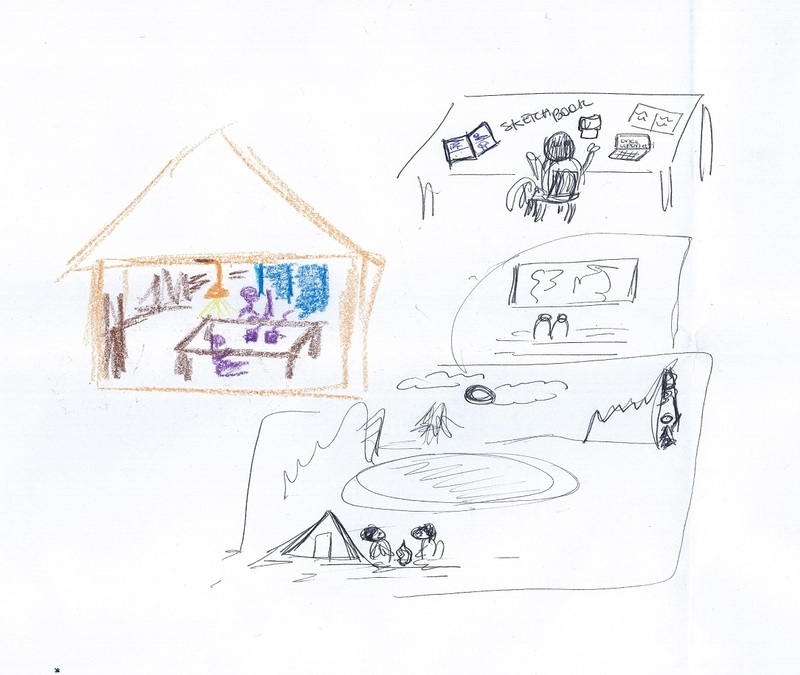 At the bottom of the drawing, the client has depicted herself camping with her boyfriend. The drawing shows them in the wild and open nature of North America sitting around a campfire. This image, for me, held all the fundamental elements of nature: earth, fire, water (the nearby lake), and air— and the natural, wild forest (a symbolic place of initiation) reflected the wild, spontaneous life of the unconscious. Also contained in this image is the male and female together around the fire of transformation and in the far corner the male and female climbing a mountain together, symbolic of the inner journey towards the Self. The total number of persons depicted here is four, a symbolic number of completion. Immediately above this image are two more: one where the couple is sitting at their kitchen table actively talking, another where they are engaged together in passive entertainment at the movies. This felt to me to represent the student’s search for love and meaning in her everyday life (at home and in society) through the ‘I’ personality. Finally, at the top of the drawing, the student is alone at her desk. She depicts herself engaged in drawing, a new creative activity that she had recently found rewarding. Her sketchbook, which is prominently labeled in the image, is a birthday present from her boyfriend, showing his love and support for her creative life. The typical start to any fairy tale, “Once upon a time…,” appears on her computer screen. In this sketch, she is alone with the Self, drawing (!) upon her newly-discovered superconscious energies. This student’s depiction of true love is a wonderful visualization of the synthesized human personality in all its aspects of true love. What is your image of true love? You might meditate on this idea and see what image appears for you. Draw the image and place it where you will see it every day. We are often afraid of true love — what it might require of us, what happiness it might bring. By imaging true love, you will come closer to creating it in your life, through all that you do, your active and passive activities, even through your suffering. Take some time to quietly imagine yourself embracing True Love and the power and awesome qualities of the Higher Self. Special thanks to the client who allowed me to share her drawing and reflections. Frankl, Viktor E. (1984). Man’s Search for Meaning. New York: Pocket Books.